Six hours later, her uterus ruptured, Nanteza and her unborn baby were both dead. An average of 16 women die every day giving birth in Uganda, victims of a health system that lacks doctors, drugs and facilities. But it is Nanteza’s death that became a rallying point for health activists who are desperate to rectify one of the worst maternal mortality rates in the world. And it is her death that may help them succeed. According to court documents, Esther Nanfuka, the nurse who took over the maternity ward that May afternoon, realized around 4:30 p.m. that Nanteza was in trouble. The baby’s heartbeat was racing and Nanteza was experiencing tremendous pain. Nanfuka suspected an obstructed delivery – the baby was not proceeding into the birth canal. An obstruction can be remedied with a Caesarean section or other operations and Nanfuka testified that she immediately began calling the doctor on duty to prepare for surgery. Uganda hospital regulations require a doctor always be available at a medical facility the size of Nakaseke. But the doctor on duty that day – identified in court papers only as Dr. Mubeezi – could not be located. Nanfuka told the court that he returned at 9 p.m.; he testified that he returned by 7 p.m. Regardless of who is right, the result was the same: He was too late to save Nanteza and her baby. In a first for Uganda, activists joined Mugerwa and his three surviving children and took the Nakaseke District Local Administration – which has oversight of the hospital – to court. Among other claims, they accused the district of violating Nanteza’s rights to life, health and freedom from inhuman and degrading treatment. On April 30, 2015 – nearly four years after Nanteza’s death – the Uganda High Court ordered the district to pay Mugerwa 35 million Ugandan shillings in damages – a little less than $12,000. For health activists, what is important is not the amount, but the justification for the ruling. In his written decision, Judge Benjamin Kabiito determined “the human and maternal rights of the deceased” were violated. It is the first time a court has ever acknowledged a constitutional right to health in Uganda, according to legal experts. Though a right to health is not explicitly mentioned in the document, for years activists have been pushing the judiciary to acknowledge an implicit right to affordable and accessible healthcare within the constitution’s broader pledges to protect human rights. And now they have it. Activists are now looking to expand their efforts to new challenges, including against businesses that are polluting community water systems or government health centers that fail to stock basic medications. And, of course, they want to address inadequacies in the health system to ensure that what happened to Nanteza never happens to another Ugandan mother. The outcome of the case is a vindication of sorts for CEHURD, which started looking to litigation to remedy Uganda’s public health gaps nearly five years ago. In its first right-to-health case, the organization’s lawyers argued in Constitutional Court in 2011 that by failing to provide basic medical equipment and health services to pregnant women, the government violated their constitutional rights to health and life. The court threw the petition out the next year, arguing it would have forced judges to weigh in on political issues outside their jurisdiction. But not before advising CEHURD to instead try a similar argument in front of the High Court – advice that paid off in Nanteza’s case. The organization’s approach was borne from the realization that “no one monitors health looking at it from the human rights perspective,” Kwagala said. “Holding the government accountable to the public was something unheard of before.” But, she argued, it was also necessary given the failure to deliver quality healthcare. While a right to health is not specifically enshrined in the constitution, the country is a signatory to the International Covenant on Economic, Social and Cultural Rights. That document compels parties to “recognize the right of everyone to the enjoyment of the highest attainable standard of physical and mental health.” The government also signed on to the 2001 Abuja Declaration, pledging to increase public funding to health to at least 15 percent of the national budget. But Uganda has not been delivering on its commitments. Funding to the health sector has stagnated at between 7 and 8 percent of the national budget most years. Meanwhile, life expectancy continues to hover around 57 years. Uganda maintains one of the 40 worst mortality rates for children under five, with 68 deaths for every live birth. And 438 women die in the course of every 100,000 births. It is no accident they chose maternal health as the first front in their effort to improve healthcare for all Ugandans. Samuel Senfuka is a project manager with the Ugandan branch of the White Ribbon Alliance, an international advocacy group pushing for safe deliveries. He said maternal mortality had historically been overlooked in the country, in favor of interventions for HIV, malaria and immunizable childhood diseases. 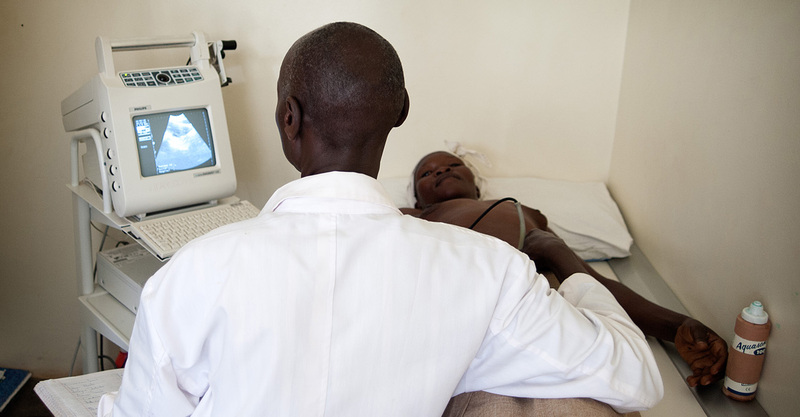 Professor Ben Twinomugisha, who sits on the faculty of law at Uganda’s Makerere University, said just the acknowledgment alone of a requirement to provide maternal healthcare means activists can demand the government hire more doctors, nurses and midwives – a move that would ultimately benefit everyone. The ruling has already sparked some changes. The Uganda Medical and Dental Practitioners Council is warning its members they can now be held legally responsible in cases of negligence. At the same time, CEHURD is preparing cases to broaden the Nanteza ruling. In one, they are suing the government over a lack of access to rabies vaccines. Despite appearing on the government’s own essential medicines list, CEHURD said the vaccine is only available at one hospital in the entire country. They are also taking a construction company to court, after a community complained that ongoing blasting has contaminated their water supply. “Now we know that people whose health rights are being violated can get remedies,” Kwagala said. Sylvia Namabidde is a member of parliament from the ruling National Resistance Movement party. She has been a champion of improved maternal healthcare in the national body, but said it has often been supplanted by other government priorities. She anticipates that a new round of lawsuits – and potential penalties – might finally get other members of the government to finally pay more attention to health. According to Senfuka, even as activists continue to work through the judicial system, it is also critical that they explain what these victories mean to the communities they are trying to help so they can advocate on their own behalf. White Ribbon Alliance is currently running a pilot program in six districts where they educate both community members and local leaders about what is required of the public health system. The advocates provide the districts with a checklist of all the services that should be available and then organize a walkthrough of public health centers, comparing the list to the reality. “We want them to understand from first-hand information how their facilities look like and the level of service delivery,” Senfuka said. It has been an effective way of turning community members into advocates for better health services. He expects that as communities are made aware of the findings in the Nanteza case, they will use it to demand more improvements. It is already happening in Arua, a town in the country’s far northwest. Beginning in August last year, the West Nile Legal Initiative for Community Empowerment began training both health workers and community members in the town on the services that should be available. And they work closely with CEHURD to bring that organization’s rights-based approach to the local level. But in February, an expectant mother traveled to a local health center to deliver. A doctor was supposed to be on duty, but she could not be located when the woman started developing complications. The mother died before she could reach a nearby referral hospital. Following the findings in the Nanteza case, Ederu said they have been encouraging the family to file suit.